I love the colour of this dish. It’s a perfect one to get your veg in whilst keeping the plate exciting. I love to make this when entertaining and usually roast the veg ahead of time and keep it warm in a switched off oven to finish it with tahini, dukkah and mint just before serving. Be sure to use good tahini for this as it makes all the difference. This recipe makes more dukkah than you will need but it keeps very well in a jar and is a wonderful addition to eggs or avocado on toast or any vegetable dish. Begin by making your dukkah. Place all the ingredients into a food processor and pulse until you have a rough broken down texture. I like to have some good chunky bits in there. Preheat oven to 200. Slice your delicata squash in half lengthwise. Scoop out the seedy centre and discard. Slice squash into roughly 1cm crescents. Place onto a roasting tray and drizzle well with olive oil and a good sprinkling of sea salt. Massage with your hands to make sure everything is covered. Roast for 25 minutes until cooked through slightly charred. Slice your broccoli into florets and slice the stalk into think disks of about 5mm. Transfer to a roasting tray. Drizzle with olive oil and sprinkle with sea salt. Massage with your hands making sure everything is coated. Roast for 15 minutes until cooked and slightly charred. 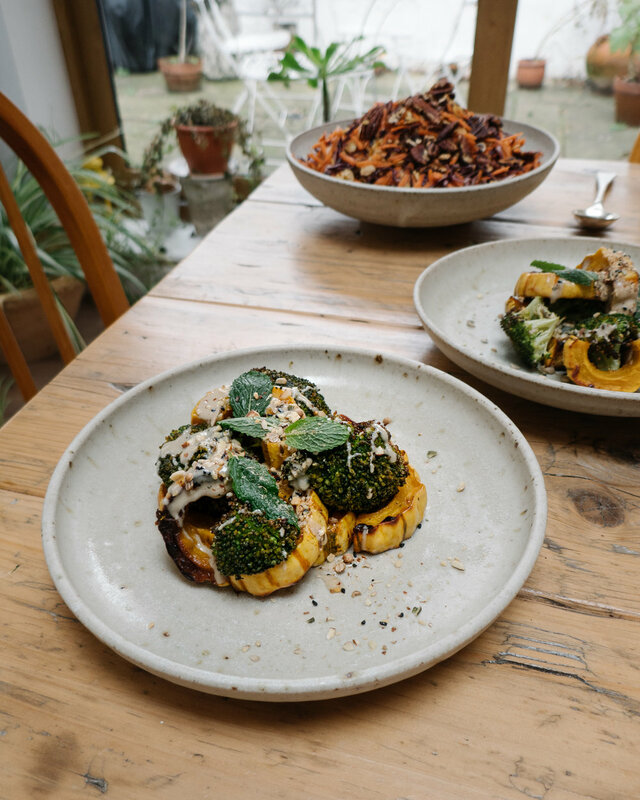 To serve arrange your broccoli and squash evenly between plates. Drizzle each with about a tablespoon of tahini. Sprinkle over a heaped teaspoon of dukkah over each and finish with a few mint leaves. About 6 or 7 per plate. You could also plate this up as a larger sharing dish.